Following two successive away defeats The Addicks will be relieved to be returning to S.E.7 on Saturday to face the blue side of Sheffield. Those two defeats were interspersed with a win against Bolton some of whose fans took time out to comment on my last piece to congratulate us on a fine win. Wednesday's season has been quite similar to ours as there have been plenty of draws and they don't score a lot of goals. They will be hoping the recent acquisition of Taylor-Fletcher on loan from Leicester will change that. The Owls main goal threat will come in the form of Stevie May who looks quite a capable player. Addicks fans will of course be hoping that Igor and Gudmundsson return to the starting eleven. It may be too early for Wiggins who picked up a foot injury last week. I'd like to see George start up front with Igor as this is potentially our best strike partnership and I don't think it was given enough time earlier in the season. At home Bulot really ought to play on the left and Gudmundsson on the right even if this means leaving Cousins out of the starting eleven. Jordan has been great this season and gives it everything but he is wasted out there and our attacking threat is curtailed without a more natural left sided player. I was pleased to Buyens have an improved game against the Trotters although he was still a bit short of his early season performances. The first half on Friday evening was awful but it was good to see the lads come out and give it go in the second half with a more determined effort. The injuries we had and with Fulham playing a lot better than at the start of the season it was always going to be a tough ask. Clearly our squad is on the thin side and a couple of experienced additions would make a tremendous difference to the team. I understand the cautious approach from Roland and his desire to run a tight ship whilst giving youth it's chance. Grant Holt is a case in point of someone who would have been a superb addition to the squad. There are others out there still but it seems unlikely that Bob will be able to add anyone unless we're right up there around the end of the year. We need to go for it from the start on Saturday and maintain that for the rest of the game. In August we showed at home what we are capable of and we have to get back to that level especially with two tricky away games coming up. 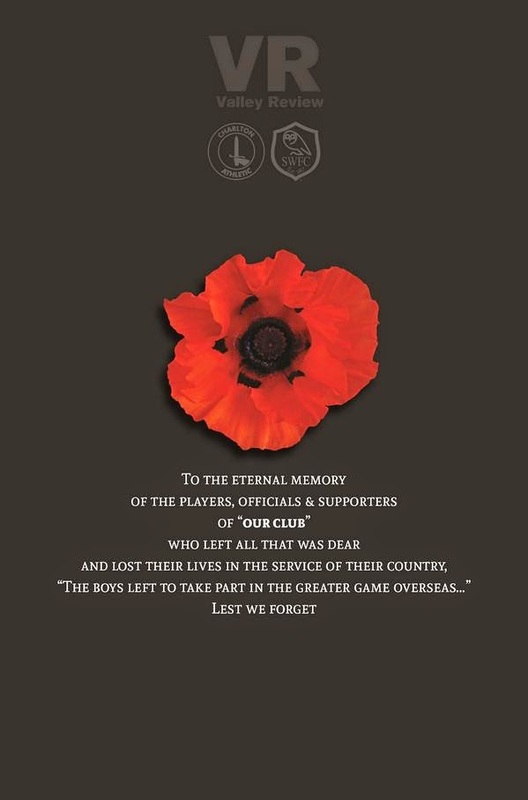 It is good to see that the club is to focus on Remembrance Day with a commemorative programme, a plaque to be unveiled and a minute's silence before the game. The 100th anniversary of the outbreak of WW1 has served to remind us of the sacrifices, horror and reality of war. Naturally with less and less people surviving from the great war then it disappears from living memory and as with all conflicts the desire that " we should never forget " is more important than ever. I know from first hand experience that our schools are playing their part in ensuring that today's children are educated about the two world wars, naturally with a greater focus on the first in this Centenary year. I hope to get along to the see the poppies at the Tower of London as many friends and colleagues have been and tell me what a moving experience this is. In the meantime I shall, along with others, pay a silent tribute on Saturday ahead of the game.